For children in Reception Class and above, they are invited to join us at Splash on a Sunday morning from 10am for a fun filled time of stories, crafts and friendship. The children begin in our main hall from the start of the service and come back to join us in church for communion. ... runs during term time and is led by Karen, Ian, Andrea and Julie. 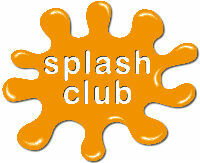 ... runs on weeks when Splash Club is not running (ie during school holidays). This is when Ripples and Splash come together and are joined by different members of the church who lead them in fun activities. This might include biscuit icing, playing games, watching a film or doing some crafts.